This is a final discussion post for the Social Justice Bookclub hosted by Kerry at Entomology of a Bookworm. 1) Men We Reaped is described as a memoir. While it draws on Ward’s personal experiences, it also explores themes much larger than one woman’s life. Do you agree with this genre classification? I would call this book part memoir part social awareness genre. In fact, I think taking away the title of “memoir” would subtract from the power of the book. The genre “memoir” suggests that a book is very personal. And describing these deaths was very, very personal to Jesmyn Ward. That much was clear from the narrative. 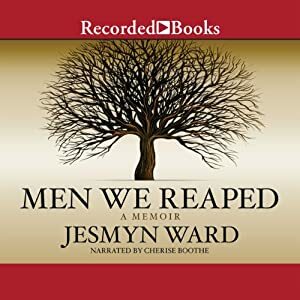 2) In what ways do you think Ward’s personal approach to this subject makes Men We Reaped stand out from other books that address similar issues? Did this make the book appeal to you more or less, or were you indifferent? I admit that I don’t read a lot of memoirs. I’m not sure why except that I like that style that many people reject: the “sounds-like-a-textbook” one. The reason for that is because I prefer the information to be well-researched and accurate. Most books I read on similar issues, therefore, do not have this personal feeling to them. They sometimes try to add to the personality by including stories about people they’ve interviewed, but this is not the same thing as listening to a first-hand account. On the other hand, it was the personal aspect of this book which made it so powerful. Therefore I’d say I’m ambivalent to the memoir format. It does and it doesn’t. Ward is given a voice because she “rose above” her background into a situation in which she could have a voice. She was talented, intelligent, and lucky. There are so many people out there without these gifts and although they are not able to express themselves as clearly and fully as Ward, they still deserve to be heard. I think most books on this subject tend to focus on the black males because they are the ones that are dying and imprisoned in droves. This book is special because it allows you to what’s going on in the mind of one female survivor of these tragedies. It gives one voice to the thousands of women out there who are surviving this messy system. I'd obviously heard of this one many times, but haven't yet read it. I recently read an excellent memoir/social analysis book and am on the lookout for similar stuff. Am adding this one to the list. If you're at all interested in it you should try it out!